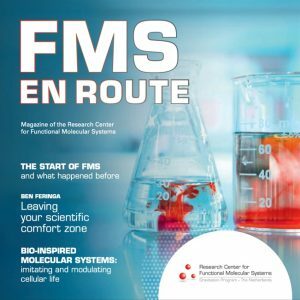 The FMS Research Center is organized around four main research programs in which elements of the grand challenge are studied based on the existing expertise within the participating groups. The program Adaptive Nanosystems (1) aims to master movement of nanoscopic objects, which will help to understand natural motility processes; the program Bio-inspired Molecular Systems (2) aims to master biomolecular assembly and confinement in order to regulate biological processes; the program Nanoscopically Structured Functional Materials (3) aims to obtain control over the spatial and temporal arrangement of molecules in order to construct dynamic functional materials. To reach the next level of control in these three research programs a fourth program is devoted to the further development of our expertise with regard to Out-of-Equilibrium Systems (4) to construct functional molecular systems with emergent, synergistic properties. These fundamental studies are performed in close collaboration with other scientists who are affiliated to the research institutes IMM, ICMS and Stratingh, which is facilitated by the research platform for molecular systems.